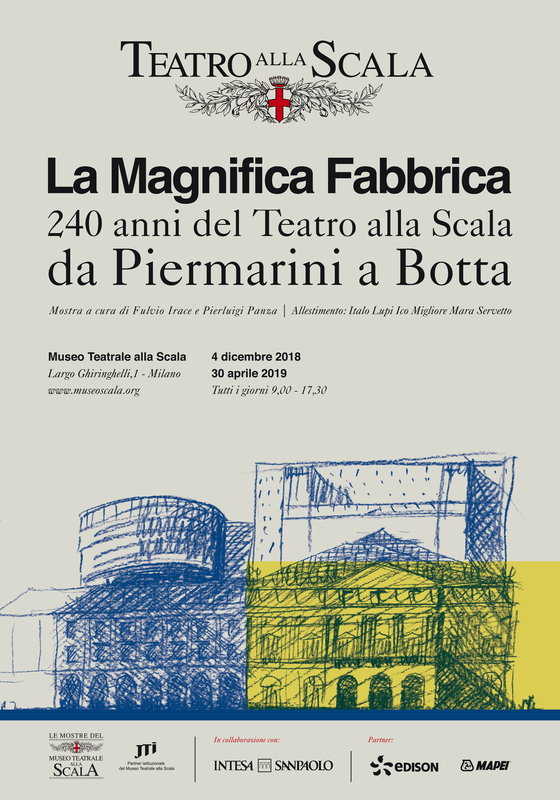 This exhibition traces 240 years of La Scala’s architectural history, from its foundation based on the designs of the architect, Giuseppe Piermarini, to Mario Botta’s extension work planned for next year. 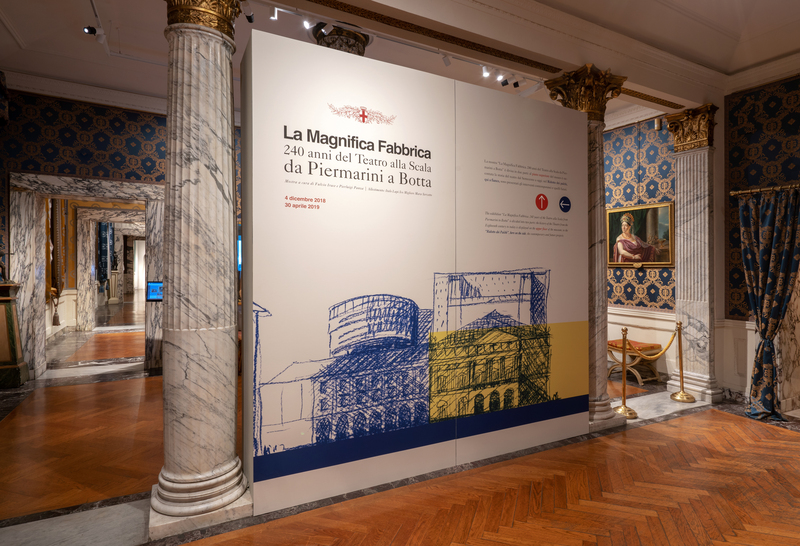 From 3rd August 1778, the date on which it opened its doors, to the present the “magnifica fabbrica” has been the scene of many changes. It has been the mirror that has reflected the city’s social development, its changes in tastes and it has been in the forefront in the introduction of technologies. What Stendhal defined as “the world’s prime theatre” has seen kings, emperors, revolutions, wars, many architects and artists who have re-drawn it. Next year, there is to be a new challenge: the creation of a new tower containing offices and services behind the fly tower. The Teatro alla Scala began life thanks to two acts of destruction of our architectural heritage and two refusals. Of the acts of destruction, one was accidental – the third fire to devastate the Regio Ducal Theatre – and one was deliberate – the demolition of the church of Santa Maria della Scala, to make way for the new theatre. The refusals came from the greatest architect of the day, Luigi Vanvitelli, who declined the invitation to design the new theatre, preferring to send to Milan his protégé, Giuseppe Piermarini, and from that immortal composer, Christoph Willibald Gluck, who preferred to leave the honour of inaugurating a theatre far from Vienna to the younger court composer, Antonio Salieri. In one month, the architect of the Chamber, Piermarini, charged with designing two new theatres in Milan, prepared “all in his own hand” the drawings: plans, cross-sections, drawings of the façade and many interior details, all complete with an estimate of costs: 494,000 lire. And in less than two years, the theatre was built – in neo-classical style – and inaugurated on 3rd August 1778. Similarly, the theatre was restored in record time between 2002 and 2004 by Mario Botta, and it reopened on 7th December 2004 with a performance of the same opera: Salieri’s Europa riconosciuta. Yet, between these two dates, numerous changes took place at the “magnifica fabbrica” of La Scala, which has mirrored the social and technological changes affecting the city and society and has been a forerunner in the introduction of technologies. The exhibition documents this history through operas, panels, videos, pictures, photographs and projections. The theatre is a soft belly, ready to adapt to any new social or technological demand. And so, from the very beginning, Piermarini’s theatre adopted many changes. In particular, as Luigi Lorenzo Secchi, La Scala’s chief engineer for half of the 20th century, wrote “in the period between 1821 and 1830, through the direct intervention and conception, or inspiration, of Alessandro Sanquirico, architect and scene designer, Piermarini’s great auditorium underwent consistent renewal, to the extent that the style and appearance of the whole auditorium changed, even down to the lighting, which originally employed candles and then oil lamps”. In February 1831, the architect, Giuseppe Tazzini, added the porticoed wing in Via Filodrammatici, while the wing along Via Verdi had already been built and altered. The next architectural revolution affecting the theatre did not come from within, but from without, when, between 1856 and 1858, the row of houses facing the theatre were demolished to make way for what was to become Piazza della Scala. This represented a revolution in the view of the theatre, which the exhibition demonstrates through technological solutions of great effect. We must remember that in 1865 work began on the arch of the Galleria Vittorio Emanuele; in 1872, the statue of Leonardo da Vinci was unveiled; then, one after the other up until 1922, the façade of Palazzo Marino was built, the Banca Commerciale was constructed to the left of the square and the Ragioneria comunale (city accounts’ office) on the right, all designed by Luca Beltrami. Meanwhile, in 1883, La Scala had opted for electric lighting, and was supplied by the Edison company’s new Santa Radegonda power station, a short distance from the Cathedral. At the beginning of the 20th century, the theatre-going public changed with the arrival of Arturo Toscanini. He put an end to the theatre as a salon and ordered that in the auditorium the lights be dimmed, silence respected and that it should be forbidden to enter once the opera has begun. In 1907, the “mystic gulf” or orchestra pit was created, thus lowering the area occupied by the musicians. From 1932, Luigi Lorenzo Secchi renewed all La Scala’s interiors. He designed the vertical distribution of the theatre creating the mirrored staircases (between the hall leading to the stalls and the ridotto of the boxes) in 1933; in 1937, he introduced the first moveable panels on the stage; then came the foyer, the ridotti of the boxes and the balconies giving La Scala that New Empire look that distinguishes it. On the night between 15th and 16th August 1943, La Scala was bombed. Once the unstable structures had been secured, Secchi began reconstruction work. The decoration of the boxes was restored using Sanquirico’s original papier mâché casts. The chandelier, which had been destroyed in the warehouses of Bovisa where it had been stored in 1940, was reconstructed and placed back in the auditorium, with its 352 lamps and the Bohemian crystal chains. And so, La Scala was reborn. On 11th May 1946, Toscanini, recently returned from the United States, conducted Mafalda Favero and the debutante, Renata Tebaldi, with Giovanni Malipiero in the inaugural concert. Other events characterised the post-war years, from the renovation of the vault to the installation of new technological services, to the construction of the Piccola Scala, later closed, and to the creation of what was be known as the Scala System, which includes the former Andsaldo works, converted into the workshop where the scenes and costumes are produced. Then came the major restoration work undertaken by Mario Botta between April 2002 and December 2004.